I heard about director Sebastian Schipper‘s Victoria only this morning. The film’s cinematographer, Sturla Brandth Grovlen, won the Silver Bear at the Berlin Film Festival for extraordinary artistic contribution for its cinematographer. Jury president Darren Aronofsky said of the movie, “This film rocked my world.” Why? Well, I’m sure the fact the movie is 134 minutes long and captured in one single take over 20 locations had something to do with it. Now Adopt Films has acquired it for a domestic release. Deadline reports the news saying the movie centers on a trio of friends (Frederick Lau, Laia Costa and Franz Rogowski) whose wild night of partying ends with a bank robbery. Scenes include underground dance raves, hold-ups, car chases, shoot-outs, kidnappings, rooftop flirtations and coffee house piano performances. It stars Spain’s Laia Costa and German actors Frederick Lau, Franz Rogowski, Burak Yigit, and Max Mauff. Jan Dressler is producer. Fly away, “Birdman” — there’s a new one-shot wonder in town, and unlike that digitally augmented opus, Sebastian Schipper‘s heart-in-mouth heist thriller “Victoria” isn’t performing any high-tech sleight of hand. Genuinely shot across 22 locations in a single bobbing, weaving, 134-minute take, this exhilarating tale of a winsome Spanish nightclubber who finds herself spontaneously caught up in a bank robbery during one wild night on the Berlin tiles is undeniably a stunt, but one suffused with a surprising degree of grace and emotional authenticity. If Luc Besson had somehow been born the third Dardenne brother, the trio might have produced something like this heady, palpitating Berlin competition entry; only “Victoria’s” considerable (but credibility-facilitating) length stands between her and a genre-crossover coup. It is a testament to the immersive immediacy of Victoria that the scale of its technical achievement only really dawns on you afterwards. Starting at 4.30am, Schipper shot continuously for over two hours in 22 locations with 150 extras, six assistant directors and three sound crews, yet we never catch a glimpse of the military-style off-screen choreography all this must have required. On a more banal level, the two leads are on screen for pretty much the entire duration. Did nobody require even a quick bathroom break? With hindsight, the boozy and ill-prepared bank-heist premise of Victoria may stretch plausibility to breaking point. But even if Schipper’s single-shot thriller is essentially one long technical stunt, it is still a bravura experiment and a kinetic, frenetic, sense-swamping rollercoaster ride. Interested? Here’s the trailer. Adopt is planning a late summer/early fall 2015 release. Here’s the description from the Berlin Film Festival. Victoria, a young Spanish woman, dances through the Berlin scene with abandon. She meets four mates outside a club who introduce themselves as Sonne, Boxer, Blinker and FuÃŸ. They quickly get chatting. Sonne and Victoria take a fancy to each other and slip away from the group at the first opportunity. But their tender flirting is rudely interrupted by the others because, for these pals, the night is far from over. To settle an old debt they have to pull off a dodgy deal. And because one of them is too drunk, they decide that Victoria, of all people, should take over the role of driver. What began as a game suddenly becomes deadly serious. 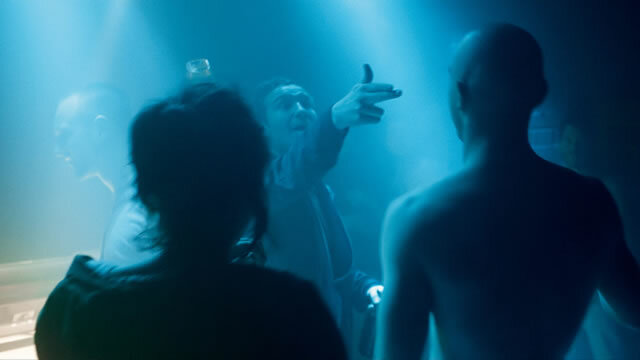 Working from his own script, actor and director Sebastian Schipper tells the story of a breathless night on the streets of the metropolis. The camera seamlessly intertwines the passing of time and numerous locations, placing the audience right in the centre of the action. Alongside the audacious gang, we gaze out across the city from tower block roofs, saunter along deserted pavements and hide out in secluded courtyards as apparently random events coalesce into a dramatic tour de force.